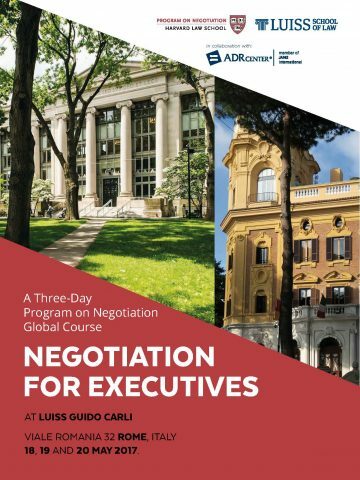 – SOLD OUT – Per la prima volta in Italia, il Program on Negotiation at Harvard Law School – insieme alla LUISS School of Law e ADR Center – offrirà il celebre corso Negotiation for Executives che si terrà il prossimo 18, 19 e 20 maggio, presso il Campus LUISS di Roma (Viale Romania 32). Il Global Course Negotiation for Executives coinvolgerà Chief Executive Officers, Company Presidents and Officers, Board Chairs and Board Members, Executive Directors, Managing Directors, Directors of Operations, Human Resources, Purchasing, Marketing, and Sales Managers, Lawyers, Mediators e Program Directors e tutti coloro che ambiscono ad accrescere le proprie performance negoziali in una tre giorni di apprendimento interattivo (con esercizi e simulazioni) dedicati allo studio della teoria e pratica della negoziazione, della gestione efficace del conflitto, delle emozioni e alle dinamiche dell’interazione umana. Ai partecipanti verrà rilasciato un Certificate of Completion from the Program on Negotiation at Harvard Law School. 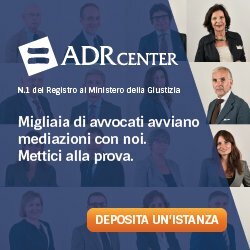 Ai partecipanti è richiesta una buona comprensione della lingua inglese. Qui è possibile scaricare la brochure del corso. 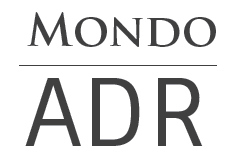 Whether you’re an experienced executive or an up-and-coming manager—working in the private or public sector, domestically or abroad—this program will help you shape important deals, negotiate in uncertain environments, improve working relationships, claim (and create) more value, and resolve seemingly intractable disputes. In short, this three-day executive education program will prepare you to achieve better outcomes at the bargaining table, every single time. Augmenting Harvard three-day programs are in-depth, one-day sessions that address tough negotiation problems— managing emotions, negotiating international deals, bargaining with “the devil” — all taught by the experts who literally wrote the books on them. Each one-day session is run only once (and space is limited), so be sure to plan ahead to reserve your space.